A cough that doesn't go away or gets worse over time. Physical exam and history: An exam of the body to check general signs of health, including checking for signs of disease, such as lumps or anything else that seems unusual. A history of the patient's health habits, including smoking, and past jobs, illnesses, and treatments will also be taken. Thoracoscopy: A surgical procedure to look at the organs inside the chest to check for abnormal areas. An incision (cut) is made between two ribs, and a thoracoscope is inserted into the chest. 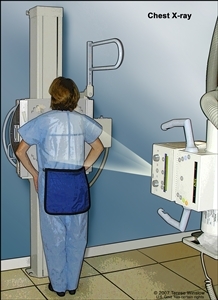 A thoracoscope is a thin, tube-like instrument with a light and a lens for viewing. It may also have a tool to remove tissue or lymph node samples, which are checked under a microscope for signs of cancer. In some cases, this procedure is used to remove part of the esophagus or lung. If certain tissues, organs, or lymph nodes can't be reached, a thoracotomy may be done. In this procedure, a larger incision is made between the ribs and the chest is opened. MRI (magnetic resonance imaging) of the brain: A procedure that uses a magnet, radio waves, and a computer to make a series of detailed pictures of areas inside the body. This procedure is also called nuclear magnetic resonance imaging (NMRI). CT scan (CAT scan): A procedure that makes a series of detailed pictures of areas inside the body, such as the brain, chest or upper abdomen, taken from different angles. The pictures are made by a computer linked to an x-ray machine. A dye may be injected into a vein or swallowed to help the organs or tissues show up more clearly. This procedure is also called computed tomography, computerized tomography, or computerized axial tomography. The metastatic tumor is the same type of cancer as the primary tumor. For example, if small cell lung cancer spreads to the brain, the cancer cells in the brain are actually lung cancer cells. The disease is metastatic small cell lung cancer, not brain cancer. 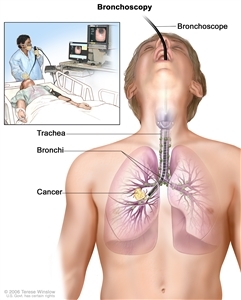 Recurrent small cell lung cancer is cancer that has recurred (come back) after it has been treated. The cancer may come back in the chest, central nervous system, or in other parts of the body. There are different types of treatment for patients with small cell lung cancer. 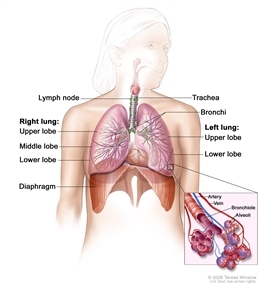 Different types of treatment are available for patients with small cell lung cancer. Some treatments are standard (the currently used treatment), and some are being tested in clinical trials. A treatment clinical trial is a research study meant to help improve current treatments or obtain information on new treatments for patients with cancer. When clinical trials show that a new treatment is better than the standard treatment, the new treatment may become the standard treatment. Patients may want to think about taking part in a clinical trial. Some clinical trials are open only to patients who have not started treatment. 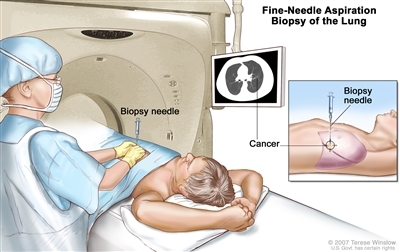 Surgery may be used if the cancer is found in one lung and in nearby lymph nodes only. Because this type of lung cancer is usually found in both lungs, surgery alone is not often used. During surgery, the doctor will also remove lymph nodes to find out if they have cancer in them. Sometimes, surgery may be used to remove a sample of lung tissue to find out the exact type of lung cancer. Even if the doctor removes all the cancer that can be seen at the time of the operation, some patients may be given chemotherapy or radiation therapy after surgery to kill any cancer cells that are left. Treatment given after the surgery, to lower the risk that the cancer will come back, is called adjuvant therapy. See Drugs Approved for Small Cell Lung Cancer for more information. The way the radiation therapy is given depends on the type and stage of the cancer being treated. External radiation therapy is used to treat small cell lung cancer, and may also be used as palliative therapy to relieve symptoms and improve quality of life. Radiation therapy to the brain to lessen the risk that cancer will spread to the brain may also be given. An endoscope is a thin, tube-like instrument used to look at tissues inside the body. An endoscope has a light and a lens for viewing and may be used to place a stent in a body structure to keep the structure open. An endoscopic stent can be used to open an airway blocked by abnormal tissue. Combination chemotherapy and radiation therapy to the chest. Radiation therapy to the brain may later be given to patients with complete responses. Combination chemotherapy alone for patients who cannot be given radiation therapy. Surgery followed by chemotherapy and radiation therapy. Radiation therapy to the brain may be given to patients who have had a complete response, to prevent the spread of cancer to the brain. Clinical trials of new chemotherapy, surgery, and radiation treatments. Check the list of NCI-supported cancer clinical trials that are now accepting patients with limited stage small cell lung cancer. For more specific results, refine the search by using other search features, such as the location of the trial, the type of treatment, or the name of the drug. Talk with your doctor about clinical trials that may be right for you. General information about clinical trials is available from the NCI website. Radiation therapy to the brain, spine, bone, or other parts of the body where the cancer has spread, as palliative therapy to relieve symptoms and improve quality of life. Radiation therapy to the chest may be given to patients who respond to chemotherapy. Clinical trials of new chemotherapy treatments. Check the list of NCI-supported cancer clinical trials that are now accepting patients with extensive stage small cell lung cancer. For more specific results, refine the search by using other search features, such as the location of the trial, the type of treatment, or the name of the drug. Talk with your doctor about clinical trials that may be right for you. General information about clinical trials is available from the NCI website. Laser therapy, stent placement to keep airways open, and/or internal radiation therapy as palliative therapy to relieve symptoms and improve quality of life. Check the list of NCI-supported cancer clinical trials that are now accepting patients with recurrent small cell lung cancer. For more specific results, refine the search by using other search features, such as the location of the trial, the type of treatment, or the name of the drug. Talk with your doctor about clinical trials that may be right for you. General information about clinical trials is available from the NCI website. This PDQ cancer information summary has current information about the treatment of small cell lung cancer. It is meant to inform and help patients, families, and caregivers. It does not give formal guidelines or recommendations for making decisions about health care.